DALLAS, TX -- MultiCam is pleased to announce a new, heavy-duty version of its popular 3000 Series nested based CNC router for the woodworking and cabinet industries. The machine features a heavy tubular steel, welded and stress-relieved frame, 25 mm linear bearings and custom engineered steel castings supporting the gantry. A variety of vacuum tables (up to 80” X 120”) and a 100% duty cycle, 13 HP automatic tool change spindle are standard. All machines can be equipped with either a 4- or 9-spindle optional 32mm drill bank. All 3000 series machines feature a high-speed simultaneous 3-axis motion control system and MultiCam’s easy-to-use, hand-held operator interface. MultiCam’s popular EZ-G code software is included and all machining systems are fully compatible with any of the popular cabinet software packages. MultiCam has over 70 Technology Centers worldwide that sell, service and support its products. 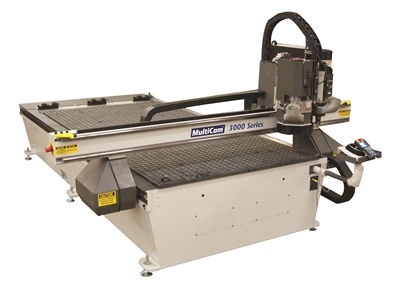 Contact us today for more information and a product demonstration of our new 3000-NB series CNC router.